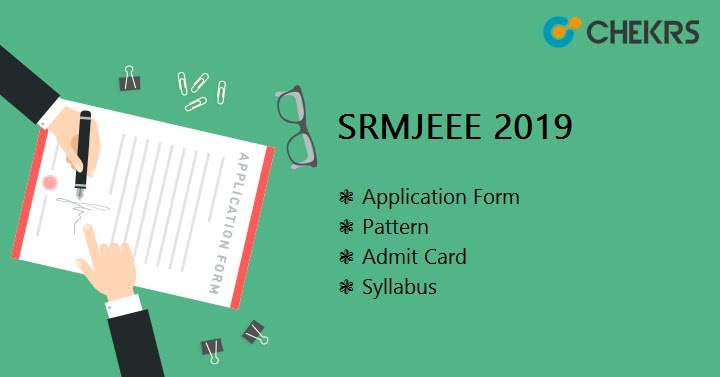 The SRMJEEE 2019 is embodied with the SRM admission process. The SRM offers a wide range of UG, PG and doctoral programs in Engineering, Management, Medicine and Health sciences, and Science and Humanities. Latest Update: SRMJEEE 2019 fully filled Application will be kept open for editing, except email id and mobile no., during April 05, 2019 – April 10, 2019, for SRMJEEE – B.Tech Check the Dates and procedure below. Latest Update: SRMJEEE 2019 Application process has been started from 27th October 2018. Check the procedure below. SRMJEEE is an abbreviated term of SRM Joint Engineering Entrance Examination. The SRM University Admission in engineering courses can be taken through SRMJEEE UG (mandatory) and PG i.e. B.Tech and M.Tech. More information related to the exam can be accessed here through information given on application, SRMJEEE Dates, exam pattern, admit card and other concerning information that can help you gear up preparation for admission. In order to get admission, one has to be scalable enough and fulfill the SRMJEEE Eligibility Criteria. Here we are sharing the details of minimum eligibility through which one can learn what standard they have to achieve. Interested candidates need to understand that only if the following eligibility is fulfilled; candidates will be given chance to given the online exam. Age limit: The minimum age of the applicant should be 17 years and maximum 21 years. Education Qualification:Passed 10+2 with Physics, Chemistry, Mathematics/ Biology/ Botany & Zoology/ Biotechnology as major subjects. No. of attempts: Those who have passed the above exam in not more than 2 attempts are eligible. Education Qualification: The candidate should have done B.E./B.Tech in relevant field with a minimum aggregate of 50% marks. Those who have made up their mind to continue their engineering studies from the SRM University will have to initiate it through filling SRM Online Application Form. The applications will be submitted in OMR Application with the receipt before the due date. Those who are keen can subscribe now so that you can take action before SRM Application Form Last Date. Here we have illustrated a few steps through which applying online will be easy. Move cursor to Admission and click on apply now. From the list of available courses, click “Apply Now” on the choicest option. Register to SRM Admissions 2019 and proceed to Apply. Fill in all the required details in the form and click on submit. Pay the fee online through convenient online option. Application Fee: INR 1100/- for all. When will SRMJEEE 2019 Exam be organized? The SRMJEEE 2019 Exam will be organize in between 15th – 25th April 2019. From Where and how we can download SRMJEEE admit card? SRMJEEE Admit Card can be downloaded from the Official Website. Steps are given below. How difficult is SRMJEEE Exams? Exam will be different, but not much. The syllabus of 2019 exam will be based on 11+12 PCM Subjects, So if you had completed the syllabus once then you will need revision and practice this time. When will the SRMJEEE 2019 Result will be Released? SRMJEEE 2019 Result is expected in May 1st/ 2nd week. Through exam pattern, it is essential for those who are appearing in the national competitive exam for the first time. Those who want that they perform really well should follow the given SRMJEEE Exam Pattern. The SRMJEEE 2019 Exam Pattern will help all applicants to know the importance of each subject and form strategies as per requirement. Though the examination includes general subjects which have been already studied by the student, SRM Entrance Exam Syllabus is important. Through the syllabus, one can learn what new topics have the chances to be asked in the exam. If you have been following SRM admission, separate and detailed information provided on latest SRMJEEE Syllabus 2019 will surely help you a lot. Moreover, for now, you can check the SRMJEEE Syllabus Pdf to initiate early preparation of the exam. As the exam is online, slot booking is the crucial step for all those who have applied. The first choice in the examination test center is taken as the default; however, through SRMJEEE Slot Booking 2019 one can change it. Within the SRMJEEE Slot Booking Dates, as updated by us you can easily choose the location and time of exam as per your convenience. The slot booking is applicable for all applicants from different states. The admit card will be provided to those whose applicants whose applications have been accepted by the university. The SRMJEEE Hall Ticket will permit entry in the exam center, containing a photo, the address of test center, SRMJEEE Exam Date 2019 and schedule. The SRM Entrance Exam Hall Ticket download can be done easily through the information provided to all through the link up to the date of exam. To make the process easier, one can also use the link updated by us. It is advisable to all appearing in the exam, to preserve the admit card; as it is required while counselling. The results of the UG and PG exams are announced on different dates. However, exam taken on different dates for the same program is announced on a single date. The SRMJEEE Result by the university is announced in May month in the form of merit list. Those whose names are mentioned in the merit list are eligible to attend the counselling. Here you are privileged with the subscription to check your result from the link updated by us right from SRMJEEE Result Date. The counselling is the final leg from where one can finalize his/her application submission details. The counseling will be done in the university only and it will be necessary to report on given dates. For the final leg of admission, SRM B.Tech Counselling dates will also be provided to us earliest. At last, qualifiers of the exam are informed to bring along their original document at the time of counselling.